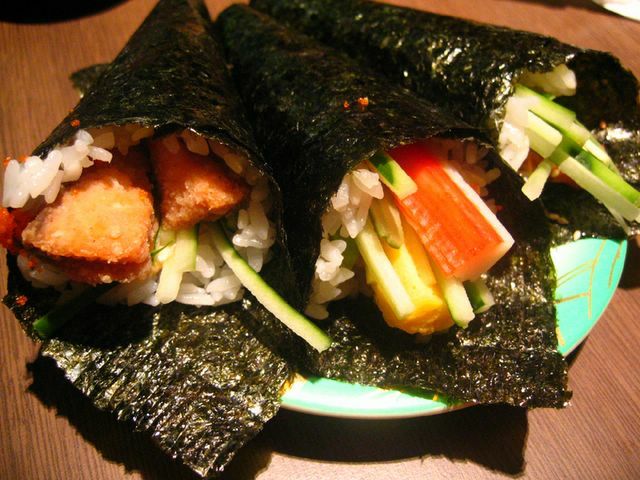 Boy, you got to admit, those california hand rolls ($1.90 each) look rather good! One thing I can’t fanthom though, is why are they called california? shouldn’t it be japanese hand rolls? makes no sense. 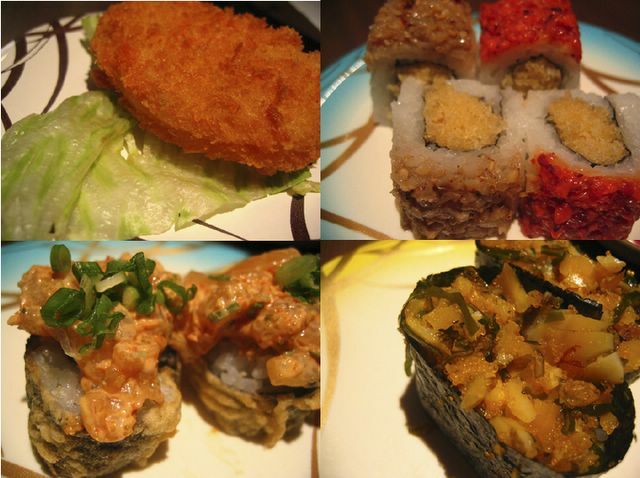 anyway I had these at Ichiban Boshi at Wisma Atria a few days ago, together with lots of other yummy jap eats. It was a get-together dinner with me and my two dearest cousins who are like sisters to me. We had a blast ordering so much and eating to our heart’s delight and the best part was the price. It was really reasonable. Read on to see and imagine how delicious the food was. And maybe you might just be tempted to rush down right away! 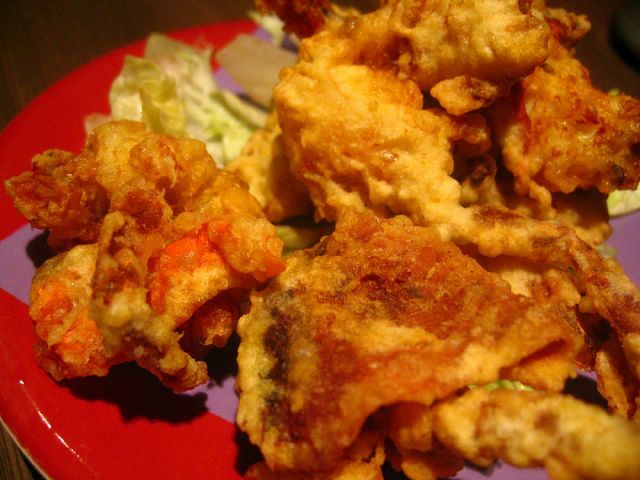 Soft shell crab tempura ($5.30). I know it looks rather weird here. However, they do taste great. It came with a bowl of soya-like sauce, which of course, complemented the tempuras. Yes, kinda unhealthy, what with the oil and all. But hey, it’s not like I eat this everyday ya? 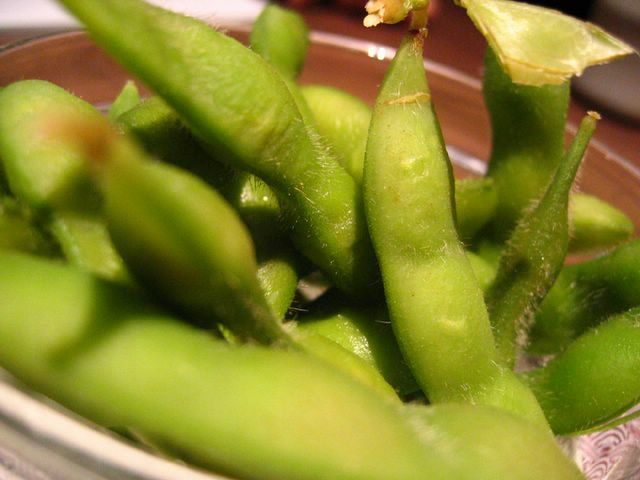 My favourite: Edamame ($1.90). In case you didn’t know, those are soya beans. The beans are still in the pods and they’re green. I love all things soya, so it was only natural that i ordered these. Of course, who can forget sashimi? 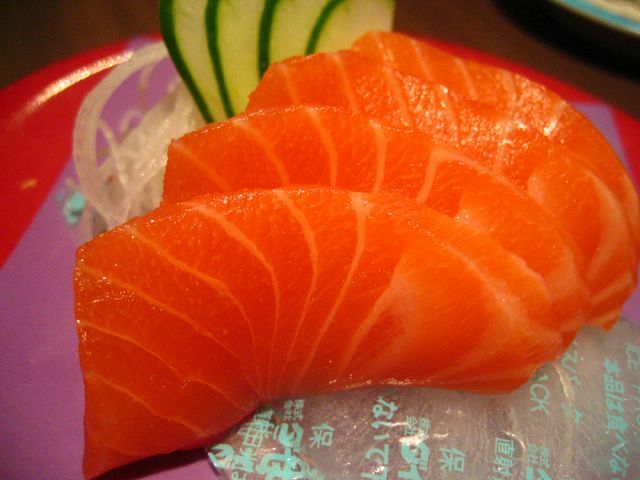 This salmon sashimi ($5.30) we ordered had a rich orange reddish hue, as you can see. Slices were thick and fresh. A pleasure to eat. I love the tenderness of it as I bite into the soft raw flesh. Yes I do have a thing for raw fish. But I actually only picked it up recently. Now I actually prefer raw salmon to cooked ones. And hey, they’re pretty healthy.. plenty of Omega 3 fatty acids. But of course, one can’t eat too much of it. Didn’t want to make you guys do so much scrolling, so i put the pictures together. And there you have it, an assortment of sushi and such. 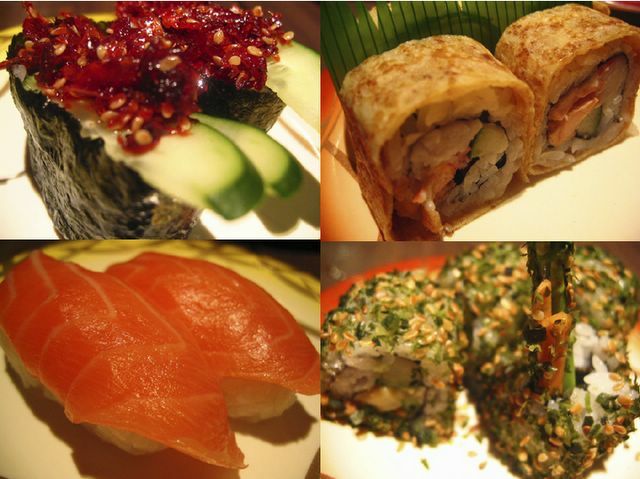 Clockwise from top left: spicy ebi, salmon kawa roll, vegetable roll and samon sushi. All these were at $1.90 each. Here’s more of what we ate… I don’t remember the all the names but the one at the top left is actually potato croquette. It’s like breaded fried mash potatoes. There were corn kernels in it. Superb. And of course the rest of the sushi rocked too. Also at $1.90 each. Ain’t that cheap? And this was how the place looked like. Not bad eh? The ambience was casual chic. You wouldn’t have thought the prices were reasonable if you’d only looked at the place. It’s really value-for-money. The sushi is really good and if you sit away from the conveyor belt, you can simply order a la carte and they’ll make it fresh for you. Marvellous. I’m definitely going back. I dun like hand roll, but the other day I went to get some seaweed nori and some stuff.. I wanna make some simple sushi one of these days~ heehee.. Oooo I love fiesta cheeesecake-original the most!! Im going to try this restaurant out for sure.. Jap food is pretty healthy~ hehe thanx for the recommendation babe! Do try out the outlet at Novena Sq. 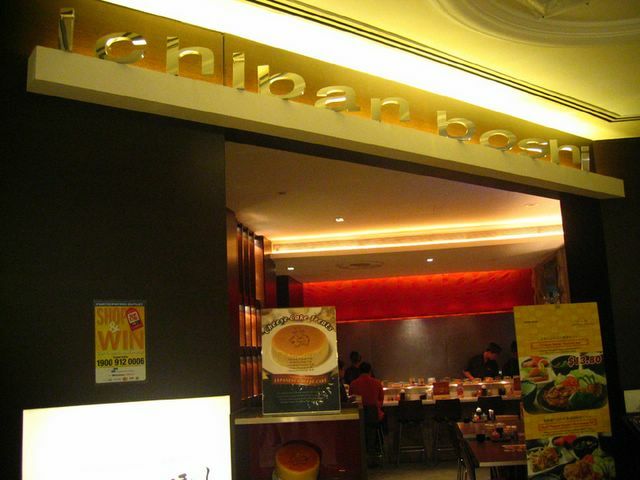 I think they serve the freshest sashimis amongst the various outlets. One of my fave places to have quality and cheap sashimis! I have also tried their tea-break specials which are really value-for-money. Enjoy! ya actually sushi quite easy to make. just have to get the rice right and buy some good seaweed. i love unagi! maybe i’ll make some for my bday party! … oh fiesta’s cheesecake. ya used to eat that often. i like how jap cheesecake is light and fluffy without being to cloying. oh yes, if you think jap food is healthy, try vietnamese food… even healthier!